Daniel’s Pick: I haven’t loved this matchup for Tennessee since I started looking at it last season. Dual-threat quarterbacks absolutely sliced Tennessee up on several occasions in 2013. And outside of perhaps Marcus Mariota at Oregon, Utah State’s Chuckie Keeton should be better than anybody else the Vols have seen in terms of the ability to throw and hurt them on the ground as well. The good news for Tennessee? I think they have at least somewhat of an advantage at every other position with the possible exception of linebacker and maybe special teams overall. But even that statement has some assumptions in it. The truth is we don’t know. There are a ton inexperienced players getting their first starts for both teams on both sides of the ball. It truly is, to borrow Butch Jones’ phrase, “the game of the unknowns.” So, how to make a pick? There are a few things I do have some confidence in that bode well for UT. 1. It’ll be a crazy environment. 2. I think Tennessee will be better coached. 3. Utah State won’t be able to shut down UT’s skill players. 4. Tennessee won’t take the Aggies lightly. With all the new weapons Tennessee has at its disposal this season, perhaps Marquez North gets slightly overlooked sometimes. He will prove to be an upper-echelon SEC receiver this year and that’ll get started with a big performance on Sunday. The Aggies, who are replacing their starting cornerbacks, won’t have anybody who can match up well with the 6-4, 221-pound receiver. He got by on mostly size and athleticism last season. Now he understands the offense more. He understands the nuances of the position better as well. That will serve him well this season. And even if his numbers aren’t huge on Sunday, that doesn’t mean he isn’t impacting the game. He’s also an improved downfield blocker, and he’ll draw defensive attention that can free up other playmakers. Houston’s Pick: The first game of the season is always a very difficult one to predict, but this year’s is bordering on impossible. Tennessee enters this game much more talented than they were at any point last season, even if that talent takes a quarter or two to get settled in. The biggest factor for Tennessee on this night, however, will be the crowd. The game is a sellout and Utah State only purchased 800 of the 102,455 tickets sold, which means that means that there will be 101, 655 Vol fans making things extremely difficult for Chuckie Keeton and the Utah State offense when they have the ball. Tennessee’s fans are starving for the return of dominance from this program and tonight offers an opportunity to help get things back on the right track. Defensively, the Vols can’t allow Keeton all day to throw or he will make them pay. They also can’t let him get loose and take off running over and over again because he has the wheels to do some serious damage in the open field. Tennessee’s pass rush has been fairly consistent over the summer when they use their blitz packages and I think they should be able to force Keeton to move around a little more than he would like to. He’ll hit some big plays and likely have a long run or two but with a new offensive line, new running backs and new receivers, I don’t think he’ll get enough help. On offense, Tennessee has a huge advantage on the perimeter. Utah State doesn’t have a cornerback taller than 5’11 and most are shorter than that, so expect the Vols to test the Aggies down the field early and often. If Justin Worley can avoid turnovers, then the Vols should have a solid night passing the ball Utah State knows that Tennessee’s biggest advantage lies in the passing game, so expect them to try to help their corners with safeties over the top. This should leave less men in the box for Marlin Lane and Jalen Hurd to have to deal with, giving them the opportunity to set the tempo on the ground early. Keep an eye out for Devrin Young as well. This is the type of game where he could do some damage against a defense that is focused elsewhere. As Daniel said above, Tennessee has added a bunch of new weapons on offense this season, and the beneficiary of all those additions will be the quarterback. I don’t think Justin Worley is an extremely talented signal caller, but I do think he is serviceable. Given the talent that he now has around him, he should have open receivers, tight ends and running backs to distribute the ball to all night against Utah State. I think Worley has a big night, passes the 300-yard mark in a game for the first time in his career and leads Tennessee to the 1-0 start they need in 2014. Reed’s Pick: The Vols opened this one as a 7-point favorite but that line has dropped to between 4.5 and 5 points. Utah State has been a trendy upset pick by many national analysts and the public seems to be buying that line of thinking. But I’m not. The Aggies won nine games last year and have one of the best quarterbacks in college football in Keeton, but they’re replacing a ton of production on both sides of the ball. Their top two receivers? Gone. Their top two running backs? Also gone. They have to replace four of their top five offensive linemen, too. Keeton may be back and even 100% healthy, but he doesn’t have many proven weapons around him. With increased overall speed and athleticism in the secondary, the Aggie passing attack shouldn’t consistently cause the Vols a ton of grief even though Tennessee’s inexperience at defensive backfield will probably result in a few big plays. The Vols defensive front should be able to put pressure on Keeton which will make the task of the young defensive backfield even easier. Curt Maggitt, Corey Vereen and Derek Barnett could be in for big days against the inexperienced and outmatched Aggie offensive line. Their ability to change the game up front will be key to a Vol victory. Tennessee has an overall talent and experience edge at most positions and should be able to take care of business as long as they don’t shoot themselves in the foot. 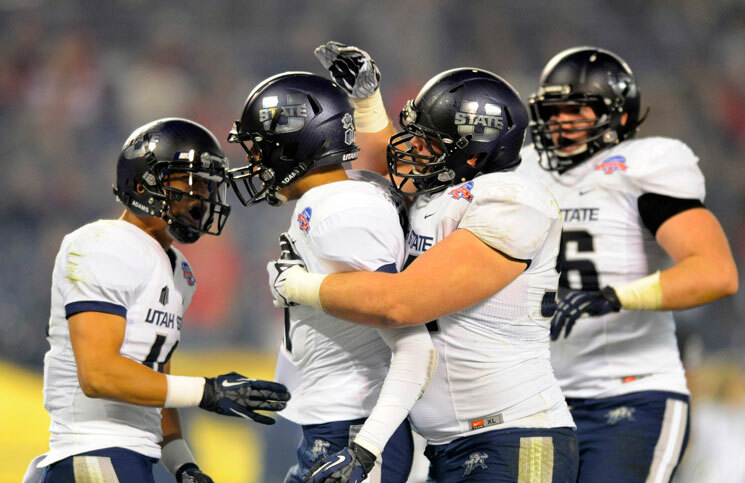 If the Vols make too many mental errors, Utah State will have a shot at the upset. That brings me to my player of the game pick: Justin Worley. Last year’s receiving corps was short on talent and experience and didn’t help UT’s quarterbacks out (with the notable exception of two miraculous catches by North in the South Carolina game). This year’s wideouts will be among the best in the SEC and Worley is a year older. Though his arm has limitations, he should be able to get the ball to UT’s playmakers with short passes and simple reads. If he does that he’ll be in for a career day and should eclipse the 300-yard mark for the first time (barring inclement weather) and lead the Vols to a decisive victory. John’s Pick: I’ll keep this short and sweet. The biggest thing that scares me about this game is that Vol Nation in general doesn’t seem to realize just how losable it is. Which is why many may be scratching their heads tonight at the start of the fourth quarter. MVP: WR Von Pearson: Hate to waffle, but the MVP will be Von or Marquez. Really just depends on which one Worley is able to find when it matters both. Sure is comforting knowing that he’s got talent like that to get the ball to.